Always have the right tool for the job with this sturdy multi-tool. 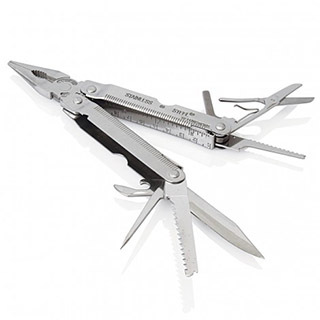 Equipped with a can opener, large blade, wood saw, screwdriver, reamer, pliers, wire cutter, wire stripper, scissors, metal file, fish hook remover, scaler, pliers, ruler and bottle opener this is the perfect piece of promotional equipment for anyone who wants to be prepared for what life throws at you. Also comes with a black nylon pouch with belt loop.